Oh, what fun you are! 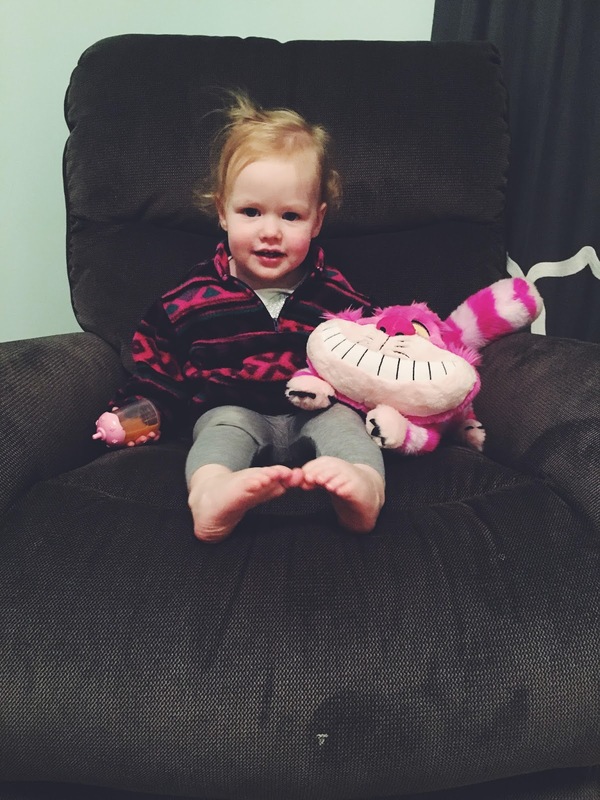 It's hard to imagine life without your spunky-ness filling our home. One of your favorite things to do is play outside with Duke. You guys love being out there together, just the two of you. Watching your little ponytail spout bob as you run and follow Duke around is such a sweet sight. You guys can sure make each other mad, but boy do you love each other. Duke is your #1 fan and he cares so much for you. Some of your favorite toys are your baby stroller, baby bottles, and your Cheshire Cat stuffed animal. One activity that you love (which always gets you in trouble) is climbing onto the couch and then onto the sofa table behind it. Duke had literally never done that in his lifetime until he saw you do it. I have no doubt that you have an adventurous spirit. When we're in the car, you take your socks and shoes off every time so it kind of takes forever for us to get into places. I have to search for where you threw your socks and shoes each time we get out of the car. At first, it really frustrated Duke. I kept reminding him that that's just what babies do. But now that it's been going on so long, I've started to get frustrated. However, Duke is quick to say, "Mom, that's just what babies do!" You two certainly keep me in check. You sleep 12-12.5 hours at night and it's not unusual for you to wake up crying at one or two points in the night. Over the past several months this has been the case. It seems like it must be a mix of teething pain, bad dreams, or just wanting one of us to come in and see you. If we do come in to comfort you, you're immediately fine when we open the door, which is why we usually let you cry it out. Your naps are anywhere from 2-3 hours. When you wake from your nap, you dramatically cry, "Opendit!" until I come and open the door. It's not funny when it's happening, but I know that later on in life, I'll laugh when I think of it. You're still a pretty great eater although you've definitely slowed down in this area. As far as teeth go, I think you've got about 10. Before naps and bedtime, we sing a song and either dance around with you in the room or rock you. You put your head on our shoulders and wrap your arms around us. It is the best feeling in the world. I believe the Lord has built those moments into our days to calm us down and remind of us of what the most important things are. Nova, you are precious to me. I love this age and I love who you are right now. I am so proud to be your mama. I love you with everything in me.